Prerequisite: Beginner Colored Pencil or instructor approval. Develop your layering and drawing skills as you begin work on independent projects. You will begin exploring color theory, advance your knowledge of color choices and learn more tips and techniques for working in this versatile medium. Learn to draw a selection of objects such as leaves, seedpods, feathers and shells. Improve your observation skills through a series of simple exercises. Complete one or more carefully rendered drawings. All levels welcome. For students wishing to learn a comprehensive approach and develop a firm foundation in the fundamentals of realistic drawing. Learn accurate measurement, alignment, proportion, shading, perspective and textures. Expect significant improvement. Attendance crucial for first three classes. 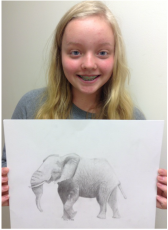 Students with some personal or classroom drawing experience will work independently with one-on-one instructor guidance and constructive critique to help bring artwork to the next level of professionalism. Students should bring copies of their preferred subjects. It’s simply magical! Students will use colorful Merino wool to create realistic felted flowers. You’ll decide whether to combine them to form a bouquet, use as gifts, or fasten on a purse or jacket. Learn the symbols Victorians associated with each flower. No experience necessary in this 7 week class. 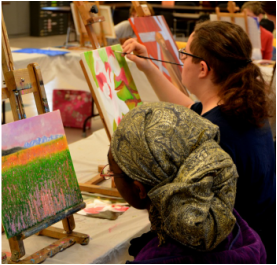 Learn the principles of painting in acrylics in this ongoing class for both new and returning students. Lessons include color mixing, brush technique, and how to apply light and dark colors to create a more realistic painting. New lessons will be introduced to apply concepts to your own work. Learn techniques to work with this versatile medium, which can be applied thickly to canvas to resemble oil paint, or thinned to resemble watercolor. All levels of students will be comfortable in this welcoming class. Learn the foundations of classical watercolor which include stretching wet watercolor paper onto special boards, working with techniques of “wet on wet” and “dry brush” in this class for all skill levels. Working on quarter sheets, subjects will be simple landscapes with the goal of learning watercolor control to produce small finished paintings. Continuing students will work on more advanced techniques. Since the 15th century, oil paints have played an important role in the evolution of art, but they can also be intimidating, with their many pigments, mediums and brushes. This beginner/intermediate painting class breaks down the fundamentals of painting a picturesque country landscape. Students will learn about composition, materials, underpainting, values (light/dark) and color theory. Students will receive individual attention along the way. The class will work from photos and will be able to view the original oil paintings. Some drawing experience helpful. This workshop will cover basic techniques for creating a believable landscape painting that will convey the illusion of depth onto a flat canvas. You will learn layering, overlapping, the use of diagonals, changes in scale and blurred edges. The use of warm/cool colors and atmospheric perspective will tie it all together into a single powerful image. NOTE: This class meets 5 weeks. Explore an appreciation of landscape painting using a transparent palette of watercolor. Students will first learn how to paint abstract shapes of natural scenery of mountains, valleys, trees and streams using simplest components of value (light, mid-tone, dark) and limited colors to create charming and realistic landscapes. Perfect for students with some experience and confident drawing skills. Learn to see color and values and meet all the challenges while having fun working in this medium. You will learn all of the techniques needed to create a beautiful finished piece of art.